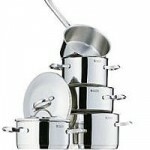 Finding and choosing the best cookware set need not be so difficult. Get it right the first time. We bring you top cookwares from around the world, straight to your kitchen. Also compare prices from the top retailers around the world.